Anglers Arapaima fishing at Palm Tree Lagoon in Thailand will be picked up at Suvarnabhum airport or their Bangkok hotel and transported in an air conditioned private hire vehicle to the venue in Ratchaburi province. 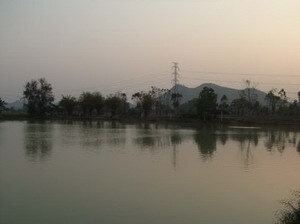 The duration of the journey to the lake lasts 2 – 2.5 hours transporting the angler through a pleasant rural landscape deep into Ratchaburi province. Palm Tree Lagoon has previously been the subject of a Discovery channel program featuring legendary UK angler John Wilson M.B.E and received considerable media attention.Palm Tree Lagoon is a commercial fishery stocked with some extremely large Arapaima with weights estimated to reach possibly 200kg+.In addition the lake also has a good stock of other predatory species with World record sized Chaophraya Catfish to an estimated 90 kg+ and specimen sized Redtail Catfish to 40kg’s+.Palm Tree is also stocked with various Carp species with Giant Siamese Carp to 60kg’s in addition to several Giant freshwater stingrays which reach relatively low weights of 40-50kg’s. Thailand Arapaima Fishing Palm Tree Lagoon. On arrival at the lake anglers angling for Arapaima will be equipped with one predator rod in addition to a Shimano baitrunner reel (or similar) loaded with 60lb braided mainline. Anglers will also be equipped with 2 carp and catfish rods and a reasonable amount of bait for the days fishing.Heavy fluorocarbon shockleaders are used in conjunction with Owner Circle hooks or live bait patterns with various livebaits or deadbaits mounted or hair rigged onto the hooks. When fishing at Palm Tree for Arapaima baits are presented in various manners including freelined on the bottom in addition to suspended float fishing methods. The Arapaima at Palm Tree Lagoon provide anglers with the opportunity to do battle with the largest scaled freshwater fish in the world! The awesome Pirarucu or Arapaima gigas is one of the world’s most spectacular freshwater predators and actively hunts prey fish throughout the day.This fantastic freshwater angling venue offers predator anglers and carp and catfish anglers alike the realistic possibility of catching a Pirarucu or Arapaima gigas of world record proportions. Predator Anglers visiting this venue will experience the amazing sight of numerous large Arapaima or Pirarucu of well over two metres long which regularly surface at various intervals round the lake! Battles with the Arapaima can be extremely fraught and strenuous affairs seeing the monster fish launching themselves skyward in an effort to shed the hook from their bony mouths. Mackerel fillets (supplied) in addition to small livebaits all score well at the lake whilst angling for Arapaima or Pirarucu. This water can be described as a moderate to challenging water which contains some truly exceptional monster fish of world record sizes. Arapaima and predator angling is at a much more relaxed pace than a lot of other commercial fisheries in Thailand and anglers fishing at the lake can expect to catch between a handful of fish to ten fish each day. 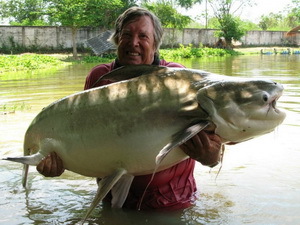 Fishsiam clients in the last year have landed Arapaima to over 180kgs, Mekong Catfish to 95kg, Chaophraya Catfish to over 50kg and Giant Siamese Carp to an amazing 71kgs. 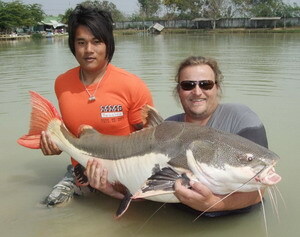 The lakes record Mekong Catfish currently runs to over 330lbs with several other monster catfish also topping the magical 100kg mark! Some of the large Arapaima or Pirarucu which are present in the lake and run to over 200kgs are exceptionally old fish which have seen a fair amount of angling pressure in the past making them extremely wary.In the event that a large Arapaima or Pirarucu is caught several guides are required to assist in the landing, unhooking and handling of the fish.In contrast to the fishs fearsome armoured appearance the Arapaima or Pirarucu is a particularily delicate fish species which requires expert handling after capture. 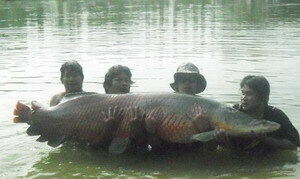 When handling Arapaima or Pirarucu it is essential that the fish is released after having completely recovered from the stress of capture.Arapaima or Pirarucu are not weighed or removed from the water under any circumstances after capture due to their delicate and fragile nature.Anglers catching a large Arapaima or Pirarucu when fishing at Palm Tree rely on measurements taken from the fish from which an estimate of size can then be calculated. Photography with a large Arapaima also requires several guides to safely hold the Arapaima and support it when lifted from the water for trophy shots. Arapaima and predator angling at this venue is between the hours of 08.00am and 20.00pm and offers predator anglers possibly one of the best opportunities to catch monster sized Arapaima in Thailand. Carp fishing at Palm Tree in Thailand is also productive with various Giant Siamese Carp and other weird and wonderful carp species also be regular visitors to the bank to 60kgs with Mekong Catfish also present inthe lake to well over 70kgs.With the considerable distance that the lake is situated from Bangkok it is advised that anglers seriously wishing to fish for Arapaima or Pirarucu spend a few days angling at this venue. Daily angling trips are available fishing at this venue in addition to longer multi day and weekly angling expeditions.Fishing at this fantastic venue for Arapaima or Pirarucu can be combined in our tailor made angling packages designed to meet the specific requirements of the visiting specialist angler to Thailand.